When this humble servant of Islam went to England to spread the message of Islam, Professor Clement Wragge was one of the blessed people that accepted the message of Islam. 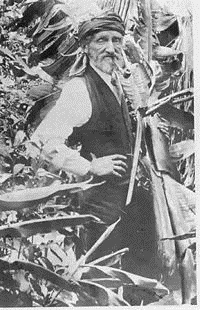 Professor Clement Wragge was a famous traveller, astronomer and a lecturer. He was born in England but spent most of his life in Australia working for the Government as an astronomer. He also wrote various books on science. His journey to Islam started when the Promised Messiah, peace be upon him, came to visit Lahore and the Professor was also in Lahore at that time. The professor gave a lecture on the topic of astrology on the train station. Mufti Muhammad Sadiq writes that from the professor’s lecture it seemed like he was a fair-minded person and he didn’t believe in Christianity blindly. So Mr Sadiq writes that he went up to him and said that “you are a traveller, you’ve been to a lot of places, but have you ever seen a prophet of God and have you heard of the Promised Messiah’s claim?” To which he replied that “I have travelled to most of the world but I have never seen a prophet of God and it is such a person I am looking for, who claims to be a prophet of God.” When Mr Sadiq presented him with a few evidences of the truth of the Promised Messiah may peace be upon him he desired very eagerly to meet with the Promised Messiah may peace be upon him. Mufti Sadiq further writes that when he returned home, he informed the Promised Messiah may peace be upon him about the professor, that he was very keen to meet with the Promised Messiah may peace be upon him. To this the Promised Messiah smiled and said that Mufti Sadiq always targets the foreigners and gave permission to Mufti Sadiq to bring the Professor. The professor and his wife came to visit the Promised Messiah may peace be upon him twice and put forward a few questions to the Promised Messiah may peace be upon him. The Professor: My wife and I feel very privileged to have the blessing of meeting with you. The Promised Messiah: I am also very happy to meet with you. The Professor: I am a traveller and a seeker of true knowledge. When a person looks at this world and the creations of this world and the wonders therein and everything that surrounds the universe, a person has to agree that the Creator of all of this can’t have just made it all for one community or religion. I believe that God is not one to limit all of this to one religion. I believe that he has made all of this for everyone, whether he is a Muslim, Christian or a Jew. The Promised Messiah: It is true that God is not only for one community or one religion. The truth of the matter is that God is for everybody. Just as God raises everybody’s body without differentiating. The way He has created all other things that provide for people’s bodies, such as food and water, in the same way He provides for their spiritual life too. This is our belief and this is what the Quran says, that God is ‘Lord of all the Worlds’. He always sends and will always send His reformers in every age to every community. The Quran says that there is no township or community in which there has not come a reformer from God. The apparent flaws we see in the books are actually not flaws but rather are why the reformers come, to renew those teachings that people have now considered being flaws. You could compare this to a physician’s medicine. As the severity of the illness changes so does the medicine. As people start to progress in their bad deeds and as they start to lead a wrong life, this is when people leave God and turn to idol worship. This is when God’s honour strikes and He sends a reformer. This is the law of God. Just as for the air, food and water that was in the time of Adam, peace be upon him, is not good for us now, but the fresh air, fresh water, and fresh food that is now, is good for us. It is essential that the weather and food for us now be different from what it was. It is God’s tradition that He changes the heavenly system according to the need. Just as the rain refreshes the atmosphere, the spiritual rain refreshes us spiritually. The Professor: This is a small world. I believe that there are other systems too. I don’t believe that the world has only existed for a few hundred thousand years and that Adam and Eve ate a fruit, because of which, the whole mankind became sinners. It is not at all our belief that life only exists on this small planet. 1) What is the definition of a sin? A person from a certain place considers something to be a sin and a person from another place might call it a deed. According to evolution man has come this far that he judges others and considers one person to be good and another to be bad. 2) What is Satan? If God is the All Knowing then why does He allow Satan to spread his evil. The Promised Messiah: Life is not only limited to this world, but life is eternal. The source of eternal happiness is God. When a person lets go of God be it in anyway whatsoever, this is when he is committing a sin. Then considering the nature of a man, the actions that are harmful to a human, those are seen as a sin in the eyes of God. Just as someone who steals, he obviously harms someone else, but with that he’s also damaging his spiritual life. Just as impure talk is bad for your spiritual life and takes a person away from God because of which, it is considered a sin. Some things are hard for a person to understand, but God is the All Knowing, He knows best what is bad and what is good for a person. He only proposes those things on man that are necessary for him. Just as a doctor knows what the best medicine is to prescribe to an ill person, but if he refuses to take that medicine that is his own fault. The sick person should be thankful to the doctor that he wishes the best for the sick person. If God wanted to, He could have not told us about the bad things at all, because He is Lord of the entire world, but He did. Just as a sick person must be very cautious of what he eats or drinks and if he is not, that would result in delaying him getting well. It is the same spiritually, that if a person is not cautious or does not refrain from certain things, in the end he would be harming himself. The right way of attaining true purification, true happiness and true comfort is through the love of God. These are the things that God doesn’t like out of respect for Himself and if a person does not refrain from them then he would be considered a sinner. This is also a fact, that the things we consider to be a sin, other nations also consider a sin. For example other religions consider stealing, lying and adultery to be a sin and all religions believe it to be disrespectful to God and that it is harmful to human nature. If anybody commits a sin he knows himself that he has done something wrong. If a person hits a child he automatically feels guilty. But when he gives some food to a poor person he naturally feels that he has done the right thing. So it is not hard to identify a sin and there are no disagreements between other faiths as to what a sin is. As I have mentioned many times regarding Satan that there are two forces in every human. One force is to be pulled towards Good and the other to Bad. The reason being, that when a person is put into a test he decides to do the right thing and through which he receives blessing from God. The Professor: Why does Sin exist? The Promised Messiah: God does not want vice nor is He happy with it, but He has given man the option for both Good and Bad so that he is awarded when he does Good, because if there were not bad in the world then there would be no Good either. This should be understood very clearly that if there were not bad there would not be any Good either. What is Good? It is when a person has opportunity or choice to steal but he doesn’t or he has an opportunity to commit adultery but he doesn’t. So you see that if stealing or adultery didn’t exist then Good would not have existed either. So this is the wisdom for creating Sin. The Professor: Christians believe that all of mankind are born sinners and this is why God had to come down again. The Promised Messiah: We believe this to be false. The people that believe in this should answer this question. The Professor: When we look at this world we see that man has gradually evolved into a higher state. But Christians say that man has declined from a higher state to a lower. They explain this by saying that God made Adam and then he committed sin and then the whole of mankind started to decline. The Promised Messiah: Our belief is not the same as the Christians, but rather we agree with your statement. The Professor: I would like to know your thoughts on the Hereafter life. The Promised Messiah: When this world comes to an end a new life starts. Those who have planted bad seeds they will bear bad fruit. Afterwards the Professor’s wife asked whether she could also ask a question? She was given permission to ask her question. The Professor’s Wife: Is it possible to meet with those people who have passed away already? The Promised Messiah: It is possible to meet somebody through a vision, but to be able to do that, it is important to make spiritual efforts to reach a level where a person can do this. I believe that a person not only while sleeping, but also when he is awake, can meet with the dead. I have met with Jesus, peace be upon him, and also with the Holy Prophet, peace and blessing be upon him, and also others who have passed away. But this is not possible for everybody. The state of a human’s heart is such that God has put many features in a human, just as a person must dig deep to reach clean and pure water. In the same way until a person does not try his utmost hardest and dig deep spiritually, then he will not be able to get to that level. After the first meeting with the Promised Messiah, peace be upon him, the Professor was very satisfied with the answers the Promised Messiah gave to his questions that he asked whether it was possible for him to meet the Promised Messiah again? The Promised Messiah graciously gave permission that he could come back again on Monday at three o’clock. Both the Professor and his wife came on time and they bought their young son with them too. The Professor: Do you believe that God has a personality or that He has emotions or do you believe that He has no personality, but is everywhere? The Promised Messiah: We do not believe God to be restricted by giving Him a personality or a human body. God is everywhere. We believe that as He is in the heavens, the same way He is in the earth. We believe Him to have two types of relationships, one that He has with the whole of mankind and the other that He has with His special people. Those people when they purify their souls and they start to excel in the love of God, they achieve such nearness with Him, that it is as though God is speaking from inside of them. The more that person purifies his soul the closer he gets to God. The Professor: If you say that God is love and justice then why is it that one nation only excels when it steps over another? Why is it that one animal eats another? How can this be God’s love and justice? The Promised Messiah: When the word ‘love’ is used for God, people always make the mistake and assume the word to mean the same type of love when used for a human. You should always remember that human love and anger are not the same as God’s love and anger. When a human loves somebody he feels traumatized at that person’s departing. A mother loves her child dearly, if her child dies, she is hurt deeply. But does God feel the same pain? Never. So the word cannot be used for God in the same context. In the same way when a person feels anger he puts himself through a sort of punishment because he starts to feel irritated inside. His happiness and comfort at that time are totally vanished. This is why we cannot say that God’s love and anger is the same as a humans. We believe God’s attributes to be incomparable. We believe the person who implores for God’s pleasure, he knows the true meaning of God’s love. To say that God is love, we do not think it to be acceptable because within the word love, it has a meaning of irritation too. We don’t find it acceptable to use a word for God that has such a cheap meaning. The Professor: Adam was born among less evolved people. Are the Americans also Adam’s children and is it true, as the Christians say, that everybody is born from Adam? The Professor: Do you believe in Evolution and if you do, then when was the soul created? The Promised Messiah: We do not believe that we evolved from monkeys. The only way we could believe that is if somebody bought a monkey that slowly evolves into a human. The natural thing today is that a monkey is born from a monkey and a human from a human. Whatever is against this, is fiction. Everybody evolves in their own kind. The Professor: I am very pleased that you beliefs are in accordance with science. The Promised Messiah: This is why God has sent me, to show that everything in religion that is true, is not against what is proven through science. The Professor: So would we call whatever are in flies and other insects’, souls too? The Promised Messiah: There are three types of Souls. Souls of Plants, Animals and Humans. True perfection is in the souls of humans. Souls of animals are on lower level and the souls of plants are at the lowest. The Professor: We believe that man is from God and he does Good so he can get closer to God, but if he commits evil, is he not forgivable? Is it true that salvation cannot be attained without accepting the concept of atonement? The Promised Messiah: I believe this belief to be absolutely false. A person attains God by his righteous deeds and through this he attains salvation. We see that in this world a person works hard and then bears the fruit of his hard work, just believing in atonement doesn’t get him that! God is a Forgiving and Merciful God and His mercy is for everyone. The Professor: This is the one thing (atonement) that I have never been able to understand, that a person can do all the good in the world, but he would still not attain salvation, until he accepts the concept of atonement! After this the Professor got up with his wife and thanked the Promised Messiah may peace be upon him and said that all the question were answered to his full satisfaction and that he was very happy. Afterwards he accepted Islam, Ahmadiyyat and stood firm to his faith until the day he died. Mufti Sahib writes that he kept receiving letters from the Professor. 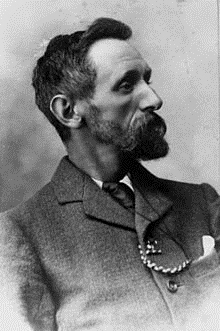 Clement Lindley Wragge (18 September 1852 – 10 December 1922), was a meteorologist born in Stourbridge, Worcestershire, England, but moved to Oakamoor, Staffordshire as a child. He set up the Wragge Museum in Stafford following a trip around the world. He was a Fellow of the Royal Geographical Society and in 1879 was elected Fellow of the Royal Meteorological Society in London. To the end of his life, he was interested in Theosophy and spiritualism and during his tour of India, met with Mirza Ghulam Ahmad of Qadian, founder of the Ahmadiyya movement in Islam who had claimed to be the Mahdi, the messianic redeemer awaited by Muslims. Sir Arthur Conan Doyle sought him out in New Zealand to ask for his views on spiritualism before writing ‘The Wanderings of a Spiritualist’in 1921. After training in law, Wragge became renowned in the field of meteorology, winning the Scottish Meteorological Society’s Gold Medal and years later starting the trend of using people’s names for cyclones. He travelled widely giving lectures in London and India, and in his later years was a reliable authority on Australia, India and the Pacific Islands. During his tour to India in 1908, Wragge met Mirza Ghulam Ahmad, who had claimed to be the Promised Messiah foretold in the Bible and Islamic scriptures. The dialogues between the two are recorded in the Malfoozat, the discourses of Ghulam Ahmad. Some of his followers believe that Wragge had converted to Islam and stayed a Muslim until his death. Proof of his conversion is cited by Ahmadiyya Muslim scholars in the form of letters written to Mufti Muhammad Sadiq, a companion of Ghulam Ahmad, by Prof. Wragge after his meeting with Ghulam Ahmad at Lahore. However more personal family records suggest that Wragge remained a theosophist up until his death in 1922.